In the late seventeenth century, pulleys and weights were first applied to timber sashes and the vertical sliding sash and case windows was born. 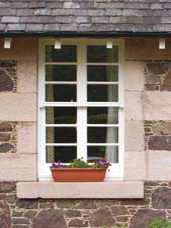 The new style of window soon caught on and they were installed throughout Scotland in the 1680s and 1690s. These very early windows have chunky timber members subdividing sashes into very small panes to suit the limited size of poor quality glass which was available. 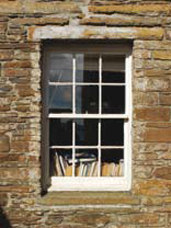 In the eighteenth century, larger pane sizes and slimmer sash members became feasible. By the middle of the century the familiar Georgian window with 6 panes to each sash had become commonplace. 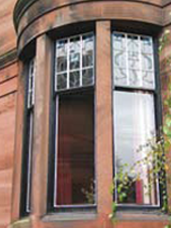 Better quality crown glass was used to glaze these windows, recognised by its distinctive curved ripples and the slight bellied effect often visible in individual panes when viewed in sunlight. True crown glass is no longer made, making it all the more important to keep any historic crown glass found. 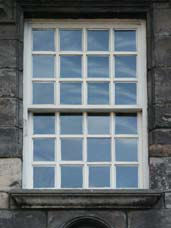 In the early nineteenth century, while the Georgian pattern continued to be used, horizontally proportioned panes called lying panes were also popular. 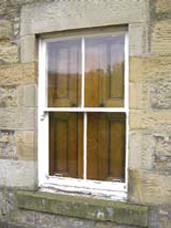 Occasionally margin panes were used in buildings of this period, an arrangement which continued to be used for stair windows long afterwards. Cylinder sheet and patent plate glass began to be used instead of crown glass. These glass types are characterised by straight ripples and by the occasional ‘seeds’ or bubbles in the glass. From the middle of the century onwards fewer subdivisions and larger, heavier panes of glass became common. Eventually sashes were glazed with single large panes of plate glass. Sash frames and joints were straightened to suit – occasionally incorporating projecting horns. As large panes became fashionable, old sashes with multiple small panes were sometimes altered – their glazing bars removed and they were reglazed with larger panes of plate glass. At the end of the nineteenth century and beginning of the twentieth century, as a reaction to the trend towards even-larger panes, small paned sash windows, sometimes with chunky glazing bars, became briefly popular again. Often windows of this period combine a multiple small paned upper sash – very often with horns – with a single or 2 pane lower sash. Upper sashes from this period sometimes incorporate stained glass – a feature that was to remain in vogue into the 1930s. 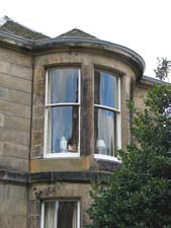 After reigning supreme in all types of buildings from castle to croft for two and a half centuries, the sash and case window finally fell out of widespread use in new buildings in Scotland in the 1950s.